High speed USB charger can charge quick and efficiently for your two devices at their full speed at the same time. Also charges other USB Powered Devices. High Speed: Fast charging for your smartphone to save more time. Smart IC inside protects against short circuiting, over-heating, over-currents, and over-charging. Charging stops when battery is full, which can maximally protect your device. Lightweight: Home charger adapter allows charging at home or in the office via USB cable connection. Simply plug in the USB cable, and plug the adapter into the wall. Compact, lightweight, portable, stylish, easy to store. 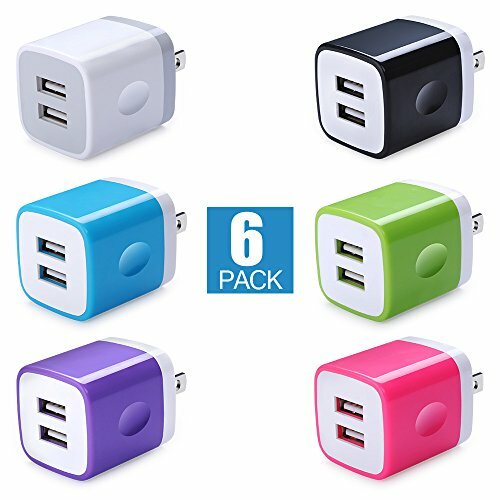 What Our Offer: Those [6-Pack] usb wall charger, 12-months Warranty. If for any reasons you are not satisfied with our service or product, please contact us first. We will do best for you! View More In Wall Chargers. If you have any questions about this product by iHoto, contact us by completing and submitting the form below. If you are looking for a specif part number, please include it with your message.